Paint and Paint 3D will continue to live in peace. 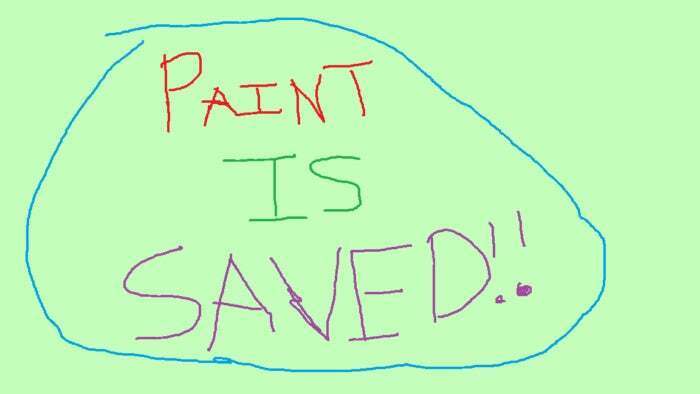 Stand down, everyone: Microsoft Paint isn’t going away after all. Microsoft signaled an about-face in a blog post Monday night by Megan Saunders, a general manager within the Windows Experiences group. Instead of deprecating Paint in Windows 10 (which seemed to many to be the first step toward oblivion), Saunders said Microsoft would release MS Paint in the Windows Store as a free app. "MS Paint is here to stay, it will just have a new home soon, in the Windows Store where it will be available for free," Saunders wrote. Saunders acknowledged the pleas of Paint fans who didn't want this longtime app to go away. "Today, we’ve seen an incredible outpouring of support and nostalgia around MS Paint," Saunders wrote. Her next words were almost sentimental, as she affirmed Paint's continuing existence: "If there’s anything we learned, it’s that after 32 years, MS Paint has a lot of fans. It’s been amazing to see so much love for our trusty old app." Microsoft had previously classified the Paint app as “deprecated” within the upcoming Windows 10 Fall Creators Update, meaning Microsoft would officially cease development on it, and it could be removed from the OS either with the release of the FCU or in the future. Microsoft apparently still plans to remove it—yet allow users access to it if they so choose. Saunders didn’t say when Paint would be transitioned over to a Store app, nor did she mention whether it would still be developed--or just preserved in amber. Saunders did say that Paint3D, Microsoft's new 3D content creation app, will remain and receive updates in the future. Paint was born with Windows 1.0 in 1985, as a licensed version of ZSoft’s PC Paintbrush. Microsoft updated Paint over subsequent versions, adding support for JPEG, TIFF, and other file formats. Though far more sophisticated imaging tools have risen around it, Paint always served as a quick-and-dirty photo editor and drawing tool. Why this matters: We'll never know whether Microsoft always planned to bring Paint back as a Store app, but there’s no doubt the company kick-saved what appeared to be an embarrassing goal against the company. Whether it be a head-scratching Solitaire subscription or just the preservation of a beloved utility, the lesson is clear: PC users don’t like their apps being messed with, Microsoft.